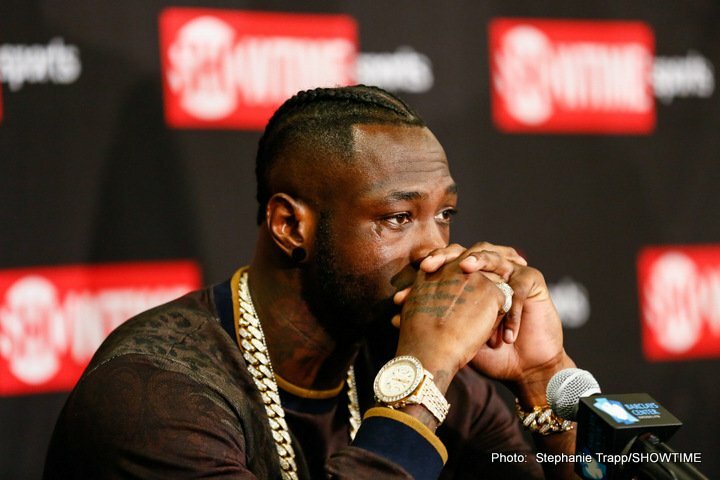 By Scott Gilfoid: It appears that Anthony Joshua’s promoter Eddie Hearn is going to be a huge roadblock stopping the unification fight between big Josh and WBC heavyweight champion Deontay “Bronze Bomber” Wilder from taking place in 2018. Hearn says Wilder can forget about getting an even 50-50 split of the revenue for the fight with Joshua. Hearn said that’s not going to happen. Wilder, 31, will need to take a pay cut for him to get the fight with Joshua (19-0, 19 KOs). Wilder will also need to earn the fight with Joshua by beating Whyte first. In the last week, Hearn has set up one condition for Wilder (38-0, 37 KOs) to get the Joshua fight next year by saying that he must fight his Machroom Sport stable fighter Dillian Whyte (21-1, 16 KOs) in early next year. Hearn has already set a date out for Wilder to fight Whyte on February 3rd at the O2 Arena in London, England. In effect, Wilder would be putting himself at risk of losing a controversial decision by fighting Whyte in his home country rather than in a neutral country. It almost seems like Hearn is setting Wilder up to fail by requesting that he earn the fight with Joshua by fighting Whyte in the UK. Hearn said this week that if Wilder refuses to fight Whyte, they’ll go the mandatory route to force him to take the fight by becoming his mandatory. If Whyte picks up a No.1 ranking with the World Boxing Council after his fight with Robert Helenius next Saturday on October 28, the WBC might place Whyte at No.1. The WBC still likely wouldn’t force Wilder to fight Whyte in 2018. Whyte would eventually get a title shot against Wilder, but not until 2019 at the earliest. It’s already academic that Wilder WILL NOT be fighting Dillian Whyte to earn a fight with Joshua. Wilder’s promoter Lou Dibella said this past week that Whyte is “irrelevant” to the fight that they want against Joshua, and they have no intention of fighting him. Hearn needs to pay attention to Wilder’s Harvard educated promoter Dibella, because he’s not likely to change his mind on this. If Hearn and Joshua want the fight with Wilder, they’re going to need to make that fight without any strings attached. If Hearn wants to match Whyte against someone, he can always some big money at Jarrell Miller or Dereck Chisora to have one of them agree to the fight. Either one of those guys would gladly fight Whyte. Hearn can increase the value of Whyte for his Matchroom Sport stable by having them fight Miller or Chisora. After the way Whyte struggled with Chisora last December in winning a controversial 12 round split decision, I don’t think Hearn will want to make that fight a second time. Hearn is obviously trying to build up Whyte, and not get him beaten before he pays off in a big money fight for his stable. The problem that Hearn has is he’s not treating Wilder in the same regard as he is his own fighter Joshua. Wilder, 6’7”, is being treated like a contender rather than a champion, and he’s being told that he won’t equal money and that will need to earn the fight with Hearn’s fighter Joshua by first facing Dillian Whyte. Hearn isn’t giving Wilder a guarantee that he’ll still get the Joshua fight even if he loses to Whyte. Hearn is telling Wilder that the winner of the Wilder-Whyte fight will be the guy that faces Joshua. As such, Joshua is the prize that Wilder and Whyte would need to fight it out for. However, even if Wilder earns the shot against Joshua to fight him in a unification, he still won’t get a 50-50 deal. It’s unclear what kind of purse split Hearn would be talking about for Wilder. Who knows? It could be 90-10, 80-20 or possibly 70-30. Given Hearn’s insistence on Wilder earning the fight against Joshua by fighting one of Hearn’s fighters under his promotional banner in Dillian Whyte, it would seem like he deserves at least a 55-45 deal. Without that, you could argue that the deal should be 60-40 in Joshua’s favor, as he’s the pay-per-view money maker in the equation. But with Wilder being asked to help Hearn increase the popularity of one of his Matchroom Sport stable fighters in Whyte, you must see that as the “Bronze Bomber” doing him a big favor by fighting him. If Wilder is going to use his Midas touch to turn Whyte into gold, then he clearly would need to have his purse split bumped for the Joshua fight in my view, because he’s being asked to do Hearn a favor by taking that fight. Hearn has things mixed up in his head. Wilder is NOT a challenger. He’s the World Boxing Council heavyweight title. Joshua is the one that wants to collect all the titles in the heavyweight division, as it would somehow validate him as a fighter if he can win them all. If Joshua wants the WBC belt, he’s going to have to give Wilder a fair split of the revenue for him to get that fight. Hearn wants Wilder to run the gauntlet to get a fight with Joshua by fighting someone totally unnecessary in Dillian Whyte. Wilder could get injured in that fight. The fight has some risk involved, and it’s not necessary for Wilder to take that fight. Since Hearn is the one that feels it’s a requirement for Wilder to get Joshua, he’s probably going to need to sweeten the deal for that fight to take place. Wilder has already asked Hearn for $7 million for the Whyte fight, and he’s been turned down. Hearn only wants to give him $3 million, which isn’t worth the risk involved. Hearn is asking Wilder to take $3 million in a fight that could result in Wilder getting beaten and then missing out on a huge payday against Joshua. I don’t know how much Wilder can make against Joshua with a 50-50 or 55-45 deal. I wouldn’t be surprised if Wilder can make more than $15 million against Joshua. So, why would Wilder take $3 million to fight Whyte in a risky fight and potentially jeopardize the huge money he can make against Joshua? The other thing is Hearn wants Wilder to fight Whyte in the UK. In other words, Wilder would be going into Whyte’s hometown, almost like he’s the B-side, and risking being robbed. If Wilder ever agreed to a deal like that, he’d be asking for trouble. If Wilder refuses to take anything less than a 50-50 deal for the Joshua unification fight, then Hearn will need to forget about the fight and stop yapping about it all the time. Wilder is a smart guy, and he obviously knows his worth. Wilder would be lowering his own value if he agreed to take less than a 50-50 split. If it were me, I would agree to a 50-50 deal if the condition was that I had to first fight Dillian Whyte to earn the fight with Joshua. Without the condition, I’d agree to a 55-45 deal. That would be fair, because Joshua does have 2 titles instead of just 1 like Wilder, and he’s able to pack Wembley Stadium in London, England when fighting popular guys like Wladimir Klitschko. It would be a pity if the Wilder vs. Joshua fight never gets made due to Hearn not wanting to give him a 50-50 deal. Those are pretty much the only guys that Joshua can look forward to fighting in the next 5 years are so. Yoka and Joyce are both being fast tracked for a heavyweight title. So, if Joshua plans on fighting for another 5 years, he’s going to wind up fighting both of those guys if they keep winning. In the meantime, it would be better if Joshua could fight Wilder, because there’s a heck of a lot of money that can be made in that fight if Hearn gives Wilder a fair split of the revenue.